This routine is really two routines in one, depending on whether a single file (or folder) is selected or multiple items are selected. Explorer++ allows you to edit the name in an in-place edit box, keeping the extension the same. The extension may be edited, but must be deleted then re-typed or selected then over-written. 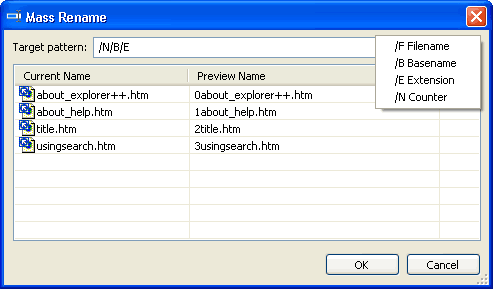 The Mass Rename dialog allows you to build a new name for all files selected using alphanumeric characters, combined with special character combinations or words. The special words are visible in a reminder box by clicking the arrow button to the right of the Target pattern: edit box. Note that special words are case-sensitive and any characters that do not form a special word are placed in the new filename as-is. Typing the new file name pattern into the edit box shows the new files previewed to the right of the existing names. Clicking OK completes the rename operation. Undo works on the entire list as a set; all files renamed by a Mass Rename as restored to their original names.